An article in World Development based on an ESID working paper on poverty reduction and the MDGs has been selected for an article collection of five papers that have a fundamental connection to the goals of sustainability and development. This outstanding research by M. Niaz Asadullah and Antonio Savoia is noteable for presenting new evidence on what produces poverty reduction. Asadullah and Savoia firstly demonstrate that the MDGs were instrumental to poverty reduction. But this still leaves unexplained why countries with similar initial conditions in terms of income poverty, had very different reductions in poverty measures. So they explain this with their finding that it is countries with more effective states, or greater state capacity, that have reduced income poverty at a significantly faster speed and so have been much more likely to achieve the MDG goal 1 of halving poverty. Their central estimates suggest that countries with the highest state capacity can reduce income poverty up to twice the speed than countries with the weakest capacity. Sustainability and development have been a central concern of World Development since its very inception: the journal was publishing papers on the topic well before the appearance of the term “sustainable development” in the lexicon of development professionals or the appearance of the Brundtland Report. It is therefore especially gratifying to recall such seminal contributions as those by Tisdell (1988), Lele (1991) and Anand and Sen (2000) that have helped clarify and establish the idea of sustainable development as a central focus of governmental and societal efforts for a more secure and prosperous future for vulnerable ecosystems and populations. To review the range and depth of articles on sustainability and development in World Development over the past thirty years is to acknowledge the effectiveness with which its reviewers, authors, and editors presaged the concerns embodied in the Millennium, and now the Sustainable Development Goals. 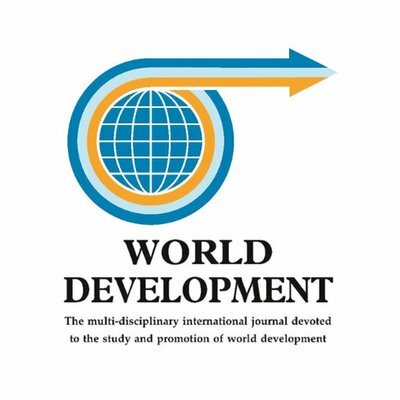 As we prepare for the inaugural World Development supported conference on Sustainability and Development at the University of Michigan’s School for Environment and Sustainability, five recent papers in the journal are worth highlighting for their fundamental connections to the goals of sustainability and development: Asadullah and Savoia 2018, Cairns 2018, Haider et al. 2018, Matin et al. 2018, and Mosse 2018. The diversity of topical concerns and methodological plurality in these recent publications demonstrate the degree to which the journal has been true to its original mission of representing heterodoxy and excellence in efforts to understand and support the processes that help the poorest and the most vulnerable. That we are committed to doing so, even in a time when the profession of Development Economics becomes methodologically and topically ever narrower in its understanding of research excellence, will be in striking evidence at our inaugural meeting in Ann Arbor, Michigan during November 9-11. Come join us! The collection and free download of the paper is available here.